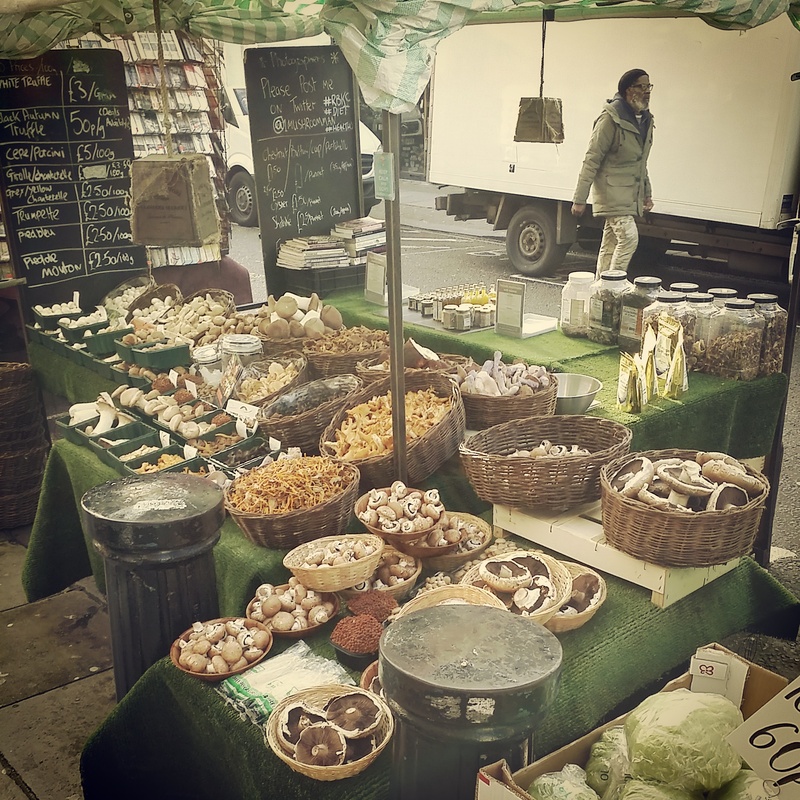 Just a stone’s throw from Portobello’s Tesco is a stall at the other end of the food spectrum: honest, healthy, community-minded and with a genuine passion for nourishment, flavour and creative cooking, Tom James Dean’s mushroom stall. Tesco (and the rest, but we’ll pick on them) sell low quality mushrooms, covered in plastic. This maintains the consistent appearance and size of the mushrooms, but not their health benefits or taste. 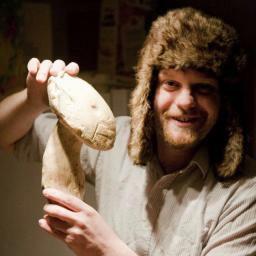 Mushrooms should shrink; Tesco mushrooms might look good (as mushrooms go), “but in reality they’re rotting away” says Tom. So, what are the benefits of buying from an expert seller like Tom? “First of all I buy from South Korea, which is known to treat their mushroom workers much better. They also grow their mushrooms in sterile conditions, in labs”. 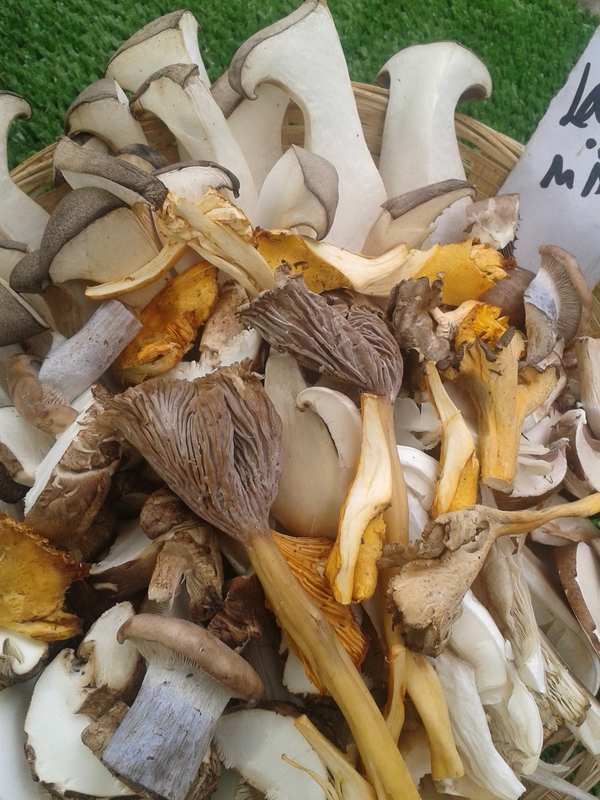 While Tom says he occasionally comes across “mushroom hobbyists” selling at Farmers’ Markets, none of the organic farms in the UK grow their own mushrooms, and instead they get them from buyers, the same buyers as Waitrose and the other chains. This is contributing to the emergence of monopolies of sellers and supermarkets and causing smaller farmers to go bust. Tom James Dean works with experts from “all over the world,” in whom he has gained trust, including Indigo Herbs in Glastonbury, knowing that his partners have a genuine interest in what they eat, and are conscious of environmental issues. Most obviously of all, “mushrooms are an ideal substitute for meat, so we can create a sustainable planet…a lot of sensible vegetarians simply change from meat to mushrooms.” Meat is murder and recent revelations have shown that not even religious slaughter is exempt from the horrors of the industry, no matter how piously packaged. Oyster mushrooms, with their bland taste may not be a favourite of the veggie community, but check this out: “they clear up landfills and oil spills…a tough mushroom”. Mushrooms absorb heavy metals, so Tom advises not to pick them in or around London. And, expert advice should always be sought when picking your own shrooms. Even in remoter areas of Wales and Scotland, picking wild mushrooms can be a health hazard, as the 1986 Chernobyl nuclear accident hit those countries more than it did Romania, and mushrooms absorb radiation. Says Tom: “the Asians are the best with Mushroom study, they believe they can create longevity. They have had evidence that proves that certain mushrooms can stop your DNA from unwinding, particularly mushrooms such as Cordyceps, Reishi and Shiitaki. 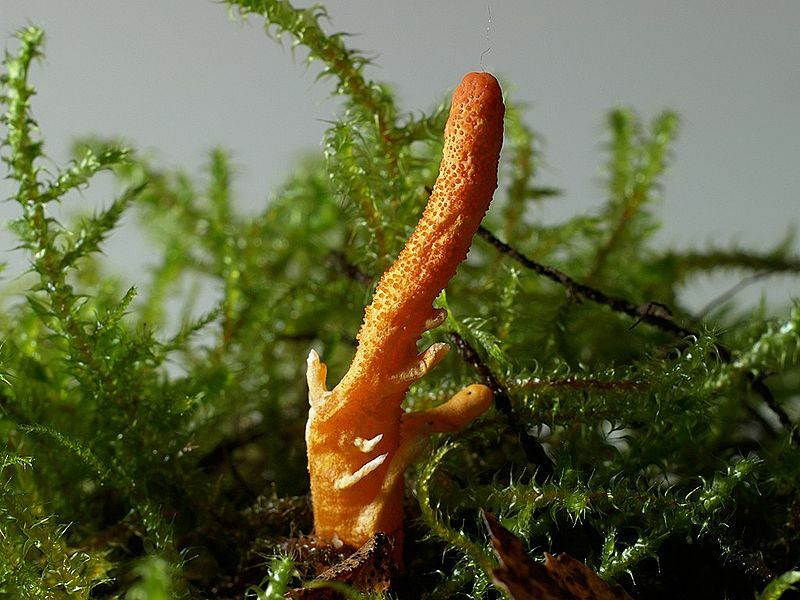 With Cordyceps they have had breakthroughs in cancer research and have successfully reduced cancerous cells. Psilocybin can ease depression and relieve headaches for six months. Chaga mushrooms are used in Russia for stomach disorders”. While the trade has been passed down from his father, Tom says his dad was a business man, first and foremost, having started importing mushrooms in 1967. Tom, though, is partly led by sound business practice, and partly by spiritual and ethical concerns, which he inherited from his mother, somebody who fed him on home grown food, “straight from the ground.” How refreshing to see this mix at work, right outside Tesco. Did we mention them already? And as he tells UDL about his parents, we can see that he’s an exact cross between both. Like his father, he has no time for quackery, he wants proof. But when he has the proof, he’s not shy about talking about it. Good news and good health are to be shared. In the middle of the Little Babylon that is Portobello Road, Tom’s stall is well worth a visit. It has a mysterious feel; Eastern, Western and from the places where we daren’t explore, these strange looking foods, grisly and grimy, contain a wealth of life-enhancing benefits. They’re weird. He says he’s weird. I don’t believe him, he’s really an enthusiast and a fountain of information. Courted by corporations, thinking about writing his first book, and keeping Portobello fresh, Tom James Dean, on the corner of Portobello and Westbourne Park Roads, is ready to share his passion with you, to educate you and to bring some well-being in to your life. 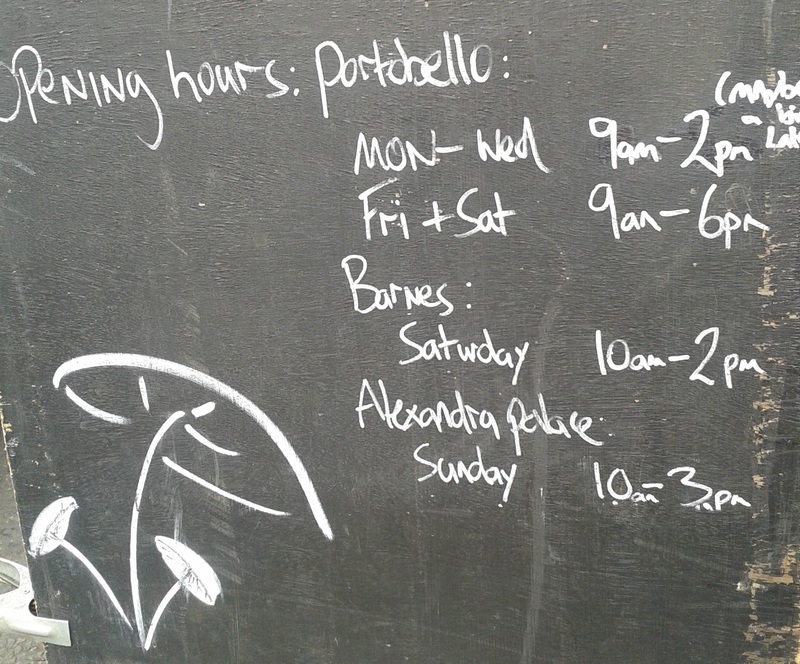 In our times and in our North Kensington, this mushroom expert is an urban sage for our age. < Previous Could have, should have, didn’t.